He is my coach. My mentor. My Sunday-lunch drinking buddy. He is funny. Wise. Has street-smarts. He’s rich, was poor, is God-loving and forever generous. He’s a family man, a Rotarian, a disciplinarian. 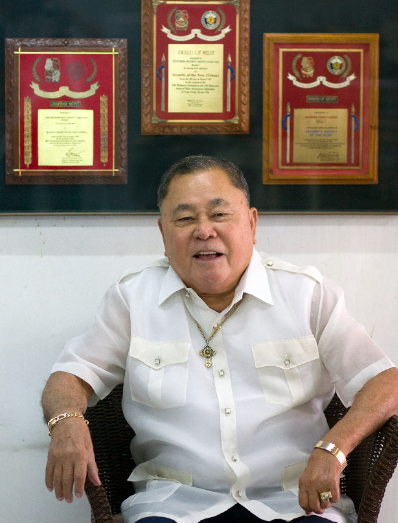 Jacinto Villarosa Mendez was born on August 17, 1931. Which makes him, today, 45 years old, right? Right. Because never mind the math, it was this morning 45 years ago–on March 4, 1965–when he established what has endured as his legacy: the Centurion Security Agency, Inc.
Today, the company that owns .45-caliber pistols commemorates its Year No. 45. How many homegrown Cebu companies can claim this longevity? Few. That’s because few people are like Jack Mendez. He wasn’t supposed to succeed. Born poor, he was raised poor. In elementary, he endured kilometers of walking on dirt roads to attend school. In college at the USC, he could barely afford to buy textbooks. When he stepped inside the library, he wore borrowed pants and, to support his studies, he mopped floors in exchange for free lodging. Manny Pacquiao? Jack Mendez was the same: he lifted wood at the pier as kargador. And, on his final year at the USC law school, his father, a firewood dealer, decided that his brothers and sisters would stop school to allow him to graduate. After passing the bar exams, he did what no other brand-new lawyer has possibly ever done: he became a security guard. While assigned at a furniture company in Manila where snakes crawled the premises at night, he squatted on table tops. Yet, he endured. He persevered. He did not let his sorry state bruise his fate. Jack’s first job was with the SSS. Despite a stable job and lofty position as division head of the Claims and Benefits branch, he dreamed beyond the Social Security System. He longed to become an entrepreneur and daydreamed of establishing his own security business. March 4, 1965. That was the moment. He named the business “Centurion.” As he envisioned, the start-up prospered. And the reason is simple: The owner was a former security guard. Who better to train and manage blue guards than a former security man himself? He understood the guard’s suffering of sleepless nights and the loneliness of working everyday, seven days from Thursdays to Wednesdays, including Christmas and Holy Week. In those mid-1960s, guards were perceived to be “notorious” and “shady.” He aimed to change that stereotype into one where people would respect security personnel who were courteous, qualified and well-trained. He did that. From one solitary guard when he started nearly half a century ago, the firm reached a peak of 1,500-strong men and women, back when they operated a second agency, Mensa (or Mendez Security Agency). 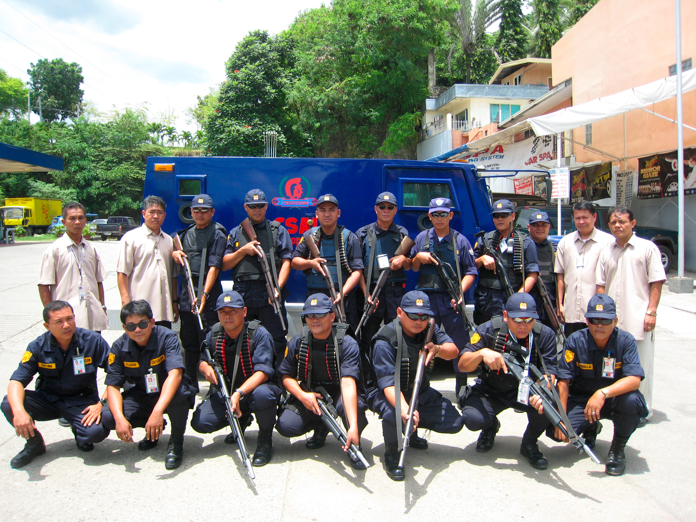 True enough, CSAI became the best: 10 times it was adjudged the “Best Security Agency for Region 7” and, three times, it was awarded the “Most Outstanding Private Security Agency” of the Philippines. Why, you ask, this story of Atty. Mendez on these back pages? Because, like metaphors, life and sports are alike. Difficulties? Challenges? Adversity? Are these not present both in our daily lives and in the lives of athletes? The story of Jack is motivating. Be you an athlete or a non-sportsman, it defines what is one of the most powerful teachings in this whole universe: You. Can. Do. It. One more lesson he imparts? Laugh. Yes. Ha-ha-ha-ha-ha. Laugh. Out loud. Win or lose, shout ha-ha-ha-ha. For life, and sports, is a struggle. But if you laugh at your own foibles and chuckle when problems arise, you’ll often succeed. And so today, to the original Centurion, to my inspiration, to my father-in-law: Sir, I salute you. what a very inspiring story! thanks for posting his story sir…this makes us more encouragement. thanks for honoring daddy. 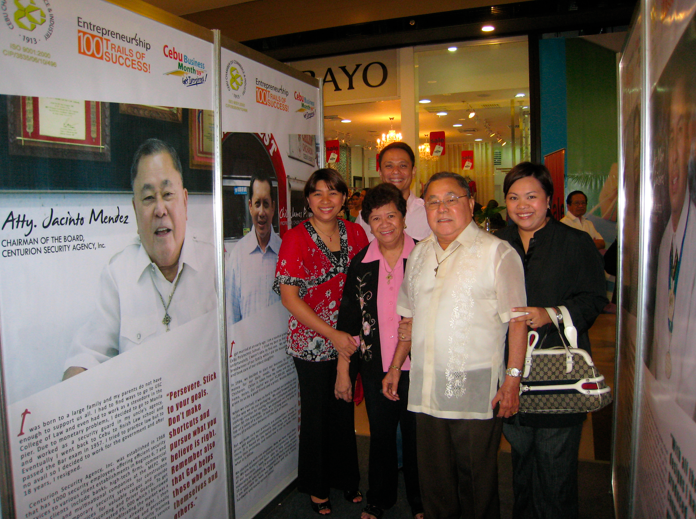 he is indeed a source of inspiration not just for our family .